Poor arc quality can be caused by a high resistance. This produces a “hot spot” due to undersized welding cables or even correctly sized cables that have cuts or splices. When you have a poor arc, double check that the weld cables are sized correctly. Both length and diameter will determine the amperage output and duty cycle required. If they are undersized, replace them. However, if the cables are correctly sized but arc quality is poor, weld for 10 or 20 minutes, stop, and feel or look for (with a Forward Looking Infrared camera) welding circuit hot spots on the weld cable. Welding circuit hot spots will cause a voltage drop and need to be repaired or replaced. High resistance hot spots are also frequently found at loose lug terminals. Sometimes, they are hidden within the cover of Dinse and Tweeco connectors. This happens because the connection between the welding cable and connector has been compromised. Cheap spring loaded ground clamps often perform poorly (even when they aren’t broken) because of the small surface contact area with the workpiece. 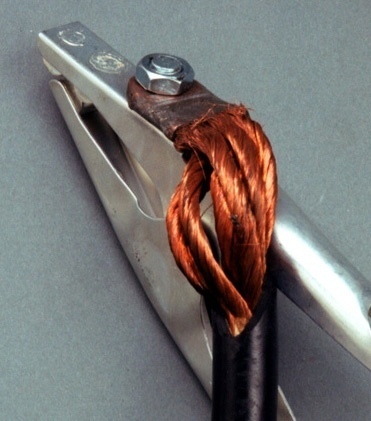 Also, when the ground cable inevitably becomes frayed at the clamp connection, high resistance and heat will result along with a degraded arc. And don’t forget to check for a tight weld cable connection to the wire feeder conductor block. If you have any questions regarding this topic, please feel free to reach out to any of us at General Air.